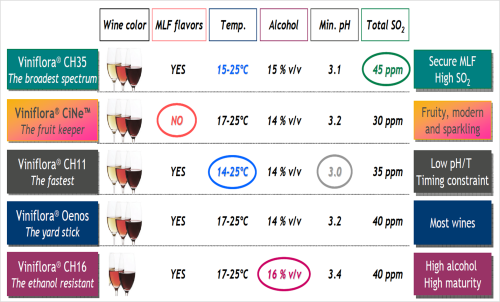 Viniflora� Oenos designed for quick and complete Malolactic fermentation. Works with either Red or White wines. Christian Hansen direct inoculation cultures � NO STARTER preparation is needed! Just add the packet in dry form to must or wine. Temperature Sensitive ! Must be shipped with Ice Packs and a minimum of 2nd Day Air (outside of California). We cannot ship this item to Canada or Outside the US. Out of State shipments leave our location only on Monday, Tuesday or Wednesday to avoid the possibility of the culture sitting in a hot UPS warehouse over the weekend. One package treats one 225 liter barrel or approximately 10 carboys! Sprinkle into must about 2-3 days after primary fermentation is visible (Co-Enoloculate) or add post fermentation. Data Sheet and Use Instructions: Click Here!